Eleanor Smith Tipton is the poetry editor of So to Speak: A Feminist Journal of Language and Art and an MFA candidate at George Mason University. She is the recipient of the Virginia Downs Poetry Award, and her poetry has appeared in Front Porch, Pleiades: A Journal of New Writing, and Best New Poets 2010.Jeff Baker is a graduate of Tennessee Tech University and the Iowa Writers’ Workshop. His poetry has been published widely, with recent works appearing in The Cream City Review, Copper Nickel and Washington Square. 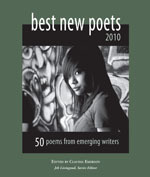 Jeff’s book of poems has been a finalist for the Bakeless Prize and the National Poetry Series, among others. Melanie McCabe is a high school English and creative writing teacher in Arlington, Virginia. In addition to BEST NEW POETS 2010, her work has appeared on Poetry Daily, as well as in The Georgia Review, The Massachusetts Review, The Cincinnati Review, Shenandoah and numerous other journals. She won second prize in Literal Latte’s 2009 poetry contest and was a finalist for the 2010 Wabash Poetry Prize and the 2009 Pablo Neruda Prize. Her manuscript History of the Body was a finalist for both the May Swenson Award and the Walt McDonald First-Book Prize from Texas Tech University. Mark Cugini keeps it thorough. His work has appeared or is forthcoming in Stymie, Device, and Petrichor Machine, among others. He is working towards his MFA in Creative Writing at American University. The prose editor of Big Lucks, he lives, teaches and is writing a novel in Washington, DC.